USD was supported due to the positive economic reports in the US such as Fed’s decision to hike the rate and the new president’s attempt to help in economic growth. 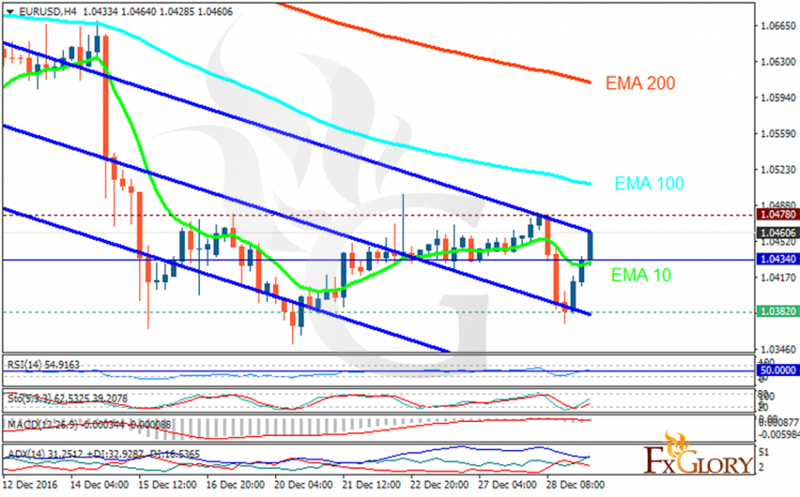 The support rests at 1.03820 with resistance at 1.04780 which the weekly pivot point at 1.04340 is locating in between the lines. The EMA of 10 is moving with bullish bias and it is below the EMA of 100 and 200. The RSI is rising above the 50 level, the Stochastic is showing upward momentum and the MACD indicator is in neutral territory. The ADX is showing buy signal. The chart seems bullish for now therefore long positions are recommended targeting the resistance area.